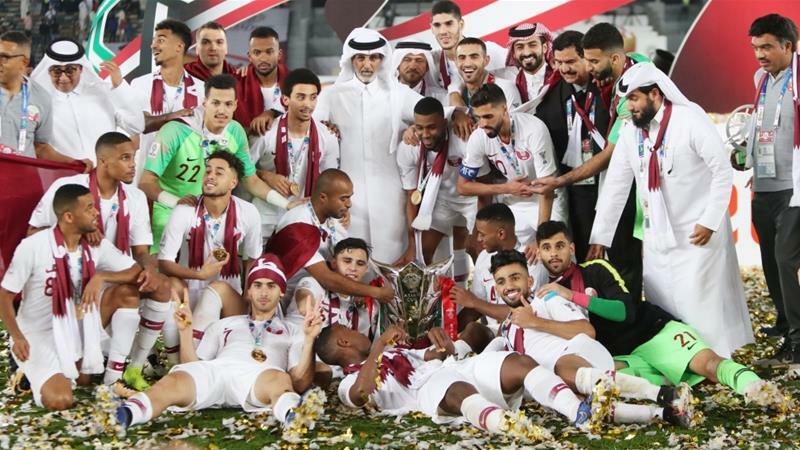 Qatar wins first Asian Cup on Friday after stunning Japan on a 3-1 victory, ignited by a moment of surprise from record-breaker Almoez Ali after nail-gnawing late show. The Sudanese-born forward Ali scored with an aerobatic-kick just 12 minutes into the game before Abdelaziz Hatim blasted home to double Qatar’s lead and Akram Afif converted VAR verdict forced the match official to give the 2022 World Cup host a deserve triumph in Abu Dhabi. Qatar endure a startle at 2-0 when Takumi Minamino pulled one back for the Blue Samurai on 69 minutes, only for Uzbek ref Ravshan Irmatov to grant the Marrons a penalty on VAR-review for a handball by Japan skipper Maya Yoshida. Almoez Ali has become the first player to score 9 goals at a single Asian Cup after being cleared to play a few hours before the tournament kickoff following a UAE challenge over Ali’s eligibility. The Qataris had been pelted with plastic bottle and shoes amid the 4-0 semi-final whipping of the hosts’ nation the United Arab Emirates over the Gulf barricade of the small energy-rich state. Emirati football authorities along these lines held up a formal dissent over the eligibility of Ali and Iraqi-born player Bassam Al-Rawi, which has been tossed out by the Asian Football Confederation. Qatar had at no other time gone past the Asian Cup quarter-finals but they scored 16 solid goals coming into the final and kept a record six clean sheets. Meanwhile, Japan had never lost an Asian Cup final, winning the last of their record four titles in 2011. However, the Blue Samurai were slashed down to a sizeable veggie by Ali’s stunning opener, taking him past Iran legend Ali Daei‘s record count of eight goals at the 1996 edition. Japan, whose only past Asian Cup loss to Qatar came 31 years prior, summoned little of note, a lot to the mortification of their bright-blue fans among an audience of 36,000 – a few donning extravagant dresses, including one tough soul in an inflatable sumo suit.